Following the invention of plate-glass and subsequently, the plate-glass mirror, Louis Daguerre and others worked feverishly to “fix” the image that they saw in the mirror and through the camera lucida. Daguerre had previously become known for his “Daguerre Dioramas” which use multiple layers of painted fabric and differentiated lighting to depict theatrical-type scenes for entertainment value. By 1838, continuing to work with light and illusion, he had realized his goal of “fixing “ the photographic (light-writing) image and sold the patent to his “Daguerreotype” process to the French government. The Daguerreotype process created a photographic image fixed onto a mirror-like surface. When the process was released to the public in the early 1940’s they found that the chemistry was not yet light-sensitive enough to provide a reasonably short enough exposure to be conducive to portraiture. 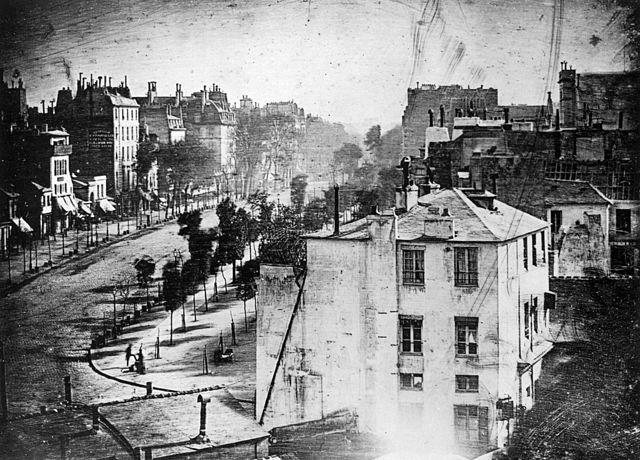 And so, the earliest Daguerreotypes were typically views of Parisian streets or rooftops, as shot from the photographers apartments.